The wedding ceremony of Akash Ambani and Shloka Mehta was deemed as the wedding of the year. The couple had been together for many years and got engaged last year in March and decided to tie the knot a year late in March this year. Their wedding was a talk of the town with everyone from CEOs of biggest firms to the Bollywood stars being present at the event. We’ve all seen thousands of pictures and videos from the sangeet and wedding of Akash Ambani and Shloka Mehta, here’s another video that shows how rich these people are to insult the king of Bollywood, Shahrukh Khan openly. The incident in question is during the baraat ceremony of Akash Ambani. While dancing at the baraat of Akash Ambani, Shahrukh Khan and Ranbir Kapoor were leading the troop. Suddenly, Akash Ambani comes to the front with his mother Nita Ambani and pushes Shahrukh Khan aside to make space for his mother to dance. This video is now making rounds on the internet and shows how crazy rich these people are and the way they treat the biggest star of Bollywood. Well, this was definitely insulting and Twitterati felt the same. Here’s how others on Twitter reacted at this video. Auqaat dikha di uskoi. Paisa pheko tamashaa dekho. But yaha Paisa bhi Diya aur side mein rakha. Lol u srk fans. 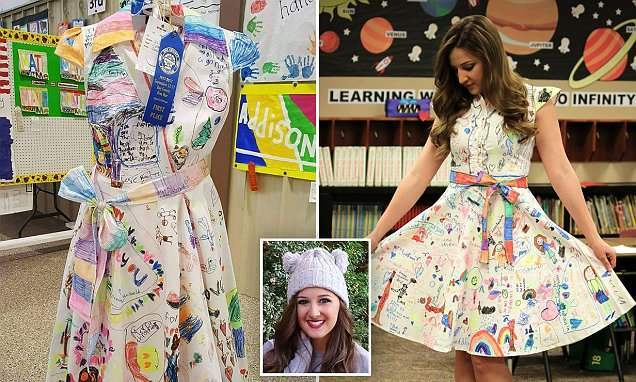 This teacher let her students draw on her white dress and the result is PRICELESS!